Songoftheyear.com songwriting news - The Robert Deller Band places in songwriting contest. The Song of the Year songwriting contest has awarded The Robert Deller Band the Semi Finalist placement in the song contest. 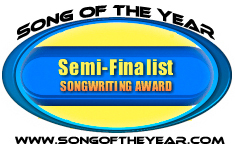 Song of the Year receives entries from all over the world and only the top songwriters receive a Semi Finalist placement in the songwriting competition.